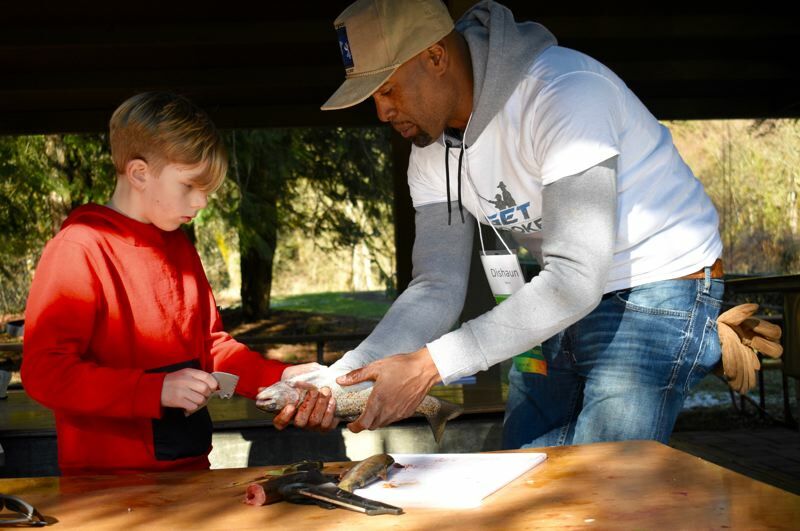 Gresham resident Ethan Pham had fun hooking a couple of trout during a weekend fishing retreat in Corbett, but also — especially for a 10-year-old — had a surprisingly philosophical takeaway from the experience. "(Fishing) is just a passion and a hobby," Ethan said. "You can go in the outdoors, get fresh air and take your mind off of things." 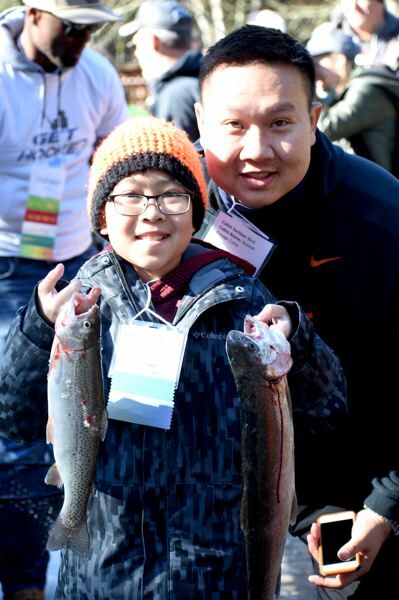 Pham and his dad, Joe, were among the families who walked away from the retreat with a couple of trout filets along with the skills for future fishing adventures. At the Association of Northwest Steelheaders' fourth-annual Family Fish Camp at Camp Angelo, 32149 S.E. Stevens Road, volunteers taught casting, knot-tying and fish cleaning the weekend of March 8-10. Families learned the basics of fishing along proper boating safety, fish licensing and regulations, not to mention fish anatomy. 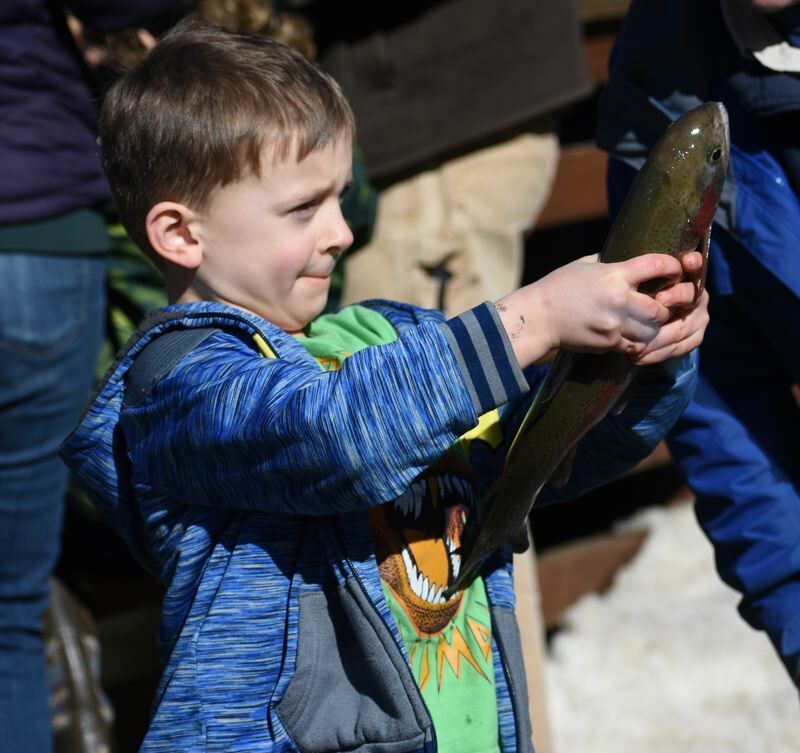 Following a morning of classroom instruction on Saturday, March 9, families put their angling skills to the test by fishing at the camp's well-stocked pond, but only the youths were allowed to keep their catches. Ethan and Joe Pham, who attended for the second consecutive year, plan on making the camp an annual father-son getaway. Between the yearly camps, the pair fish regularly on Oregon lakes and rivers. Last year they caught a six-pound steelhead on the Siletz River near the Oregon Coast. 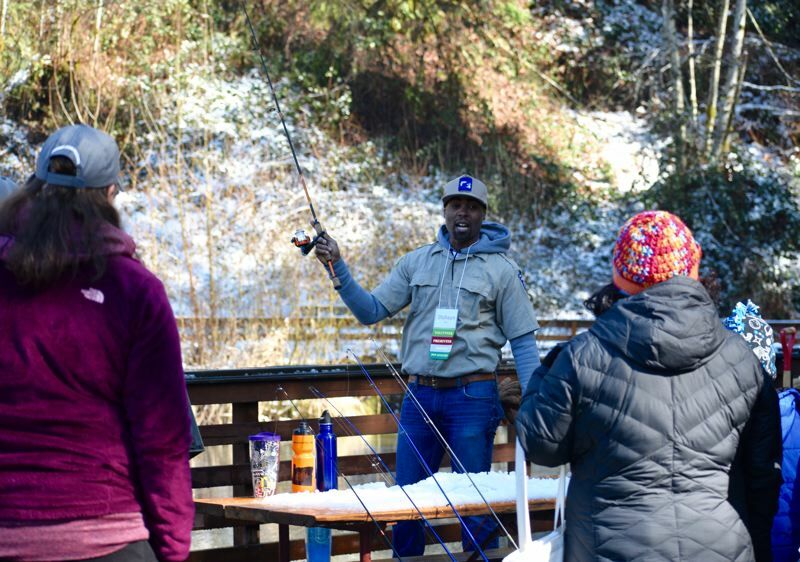 Northwest Steelheaders President Tom VanderPlaat said the camp was a way to teach children and adults of any skill level how to fish. While the experienced Pham family brought their own gear, the camp provided all necessary fishing equipment for those who didn't. 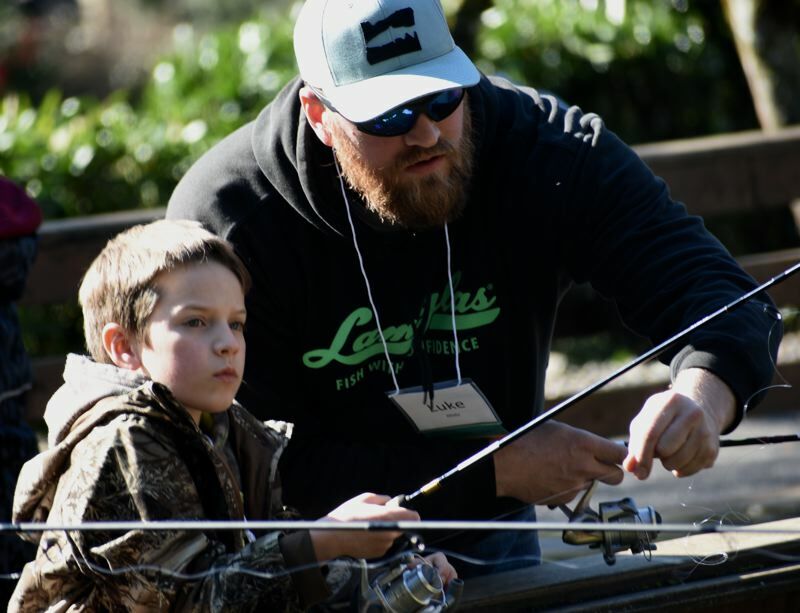 That helps families experience fishing without investing a large sum of money into a sport they may know little about. 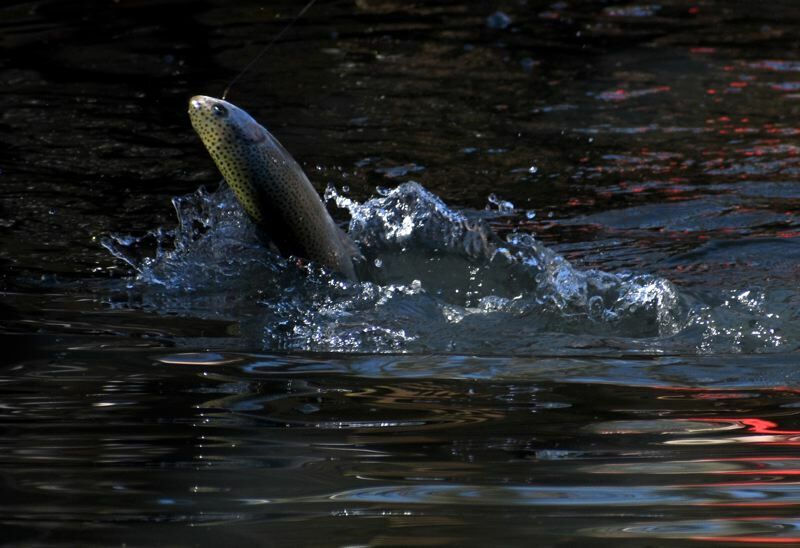 The state needs more anglers, VanderPlaat noted, because the more residents fish, the more they're inclined to support fishing as a natural resource. Angie Means of Happy Valley attended the fishing camp with her 9-year-old son Chase to hone her fishing skills. She had taken Chase for a mother-son fishing trip following a divorce, and found her lack of angling experience didn't bode well. "I took him fishing one day and he was all upset," Angie recalled. The camping weekend went better, and Chase pulled a couple of trout from the pond. Once the young anglers had their catches, they headed to a fish-cleaning station. Gutting fish will likely be useful a skill for Chase on his next mother-son fishing adventure because Angie said she's unwilling to touch fish innards. 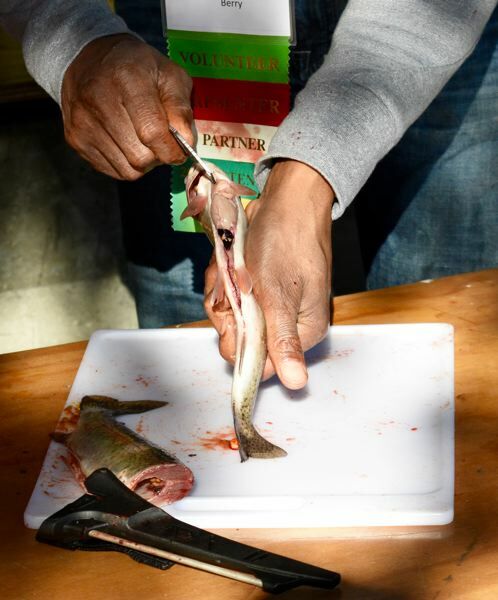 Dishaun Berry, founder of Get Hooked, an outdoor fish and advocacy organization that promotes outdoor activities for at-risk youth, showed Chase how to remove a Trout's organs. Not sharing his mother's squeamishness, the boy was fascinated as Berry described the fish's anatomy, and explained to Chase how a fish's heart can still beat even after the animal's head is removed. Cleaning fish is an important part of the angling process, Berry noted, and eating the catch shows respect. "We teach them that if you catch (and keep) it, you're going to eat it," he said. Camp attendees Luke Hintz, his significant other Andie Bohnsack and Angie's 10-year-old son, Bear, know that lesson well. The Troutdale family often eats meat gathered from family hunting and fishing adventures. They used the weekend retreat to get Bear connected with other children who share similar outdoor interests. The first fish Bear caught — outside of camp, that is — was 25 inches long. Before they hit the fishing pond, he was optimistic he would have even better luck that afternoon. "I'm going to catch a bigger one today," Bear shouted. "I'm going to catch one as big as a tree!" The Association of Northwest Steelheaders is an Oregon-based sport fishing and conservation group founded in 1960 to promote steelhead as a game fish. The group provides conservation and angler education and advocates to protect public access to waterways. The association has 11 chapters in Oregon and one in Washington. For more information, visit http://www.nwsteelheaders.org.